Wow!! It's been so long since I posted on this blog, though my main blog I do keep up regularly. I still have not finished my Mirabila cross stitch even though I was aiming for the end of 2011. I have nearly finished, I must say and have been working on it during my time of work these past few weeks. 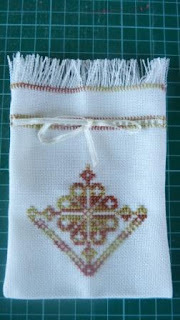 So amongst my sewing I have also been doing during my break I completed one little cross stitch. I was given this little kit about 10 years ago and at the time had only used 12ct and 14ct Aida fabric, so when I got a 25ct fabric it was beyond me at the time. I started stitching it then noted it was all wrong, so unpicked it all and it became a UFO. Well only a few days ago I remembered this UFO and dug deep in my chest in my bedroom and out it came. Over a few hours at night watching Scary Movie with hubby and son, then the next day watching some teen flick with daughter and friend I sewed it all up. I wonder now what was all the fuss all those years ago, as it was do simple to do. Also the first time I hem stitched and that was a breeze too. So here is the Rainbow Sachet competed. This was a Cross Stitch kit from Treasured Times which is/was based in Christchurch. My sister'n'law gave it to me as a Xmas present.